A comprehensive mental health professional, Maha Wakim earned her Master’s degree in Clinical Psychology from the University of Indianapolis, Indiana in 2001, and became a certified Master Life Coach and NLP practitioner in 2011 and an NGH (National Guild of Hypnotists) certified hypnotherapist in 2012. Wakim has a varied experience as a trainer, teacher, clinical supervisor, psychosocial support specialist and psychotherapist. She has also worked in various capacities with local and international organizations including Danish Refugee Council, Diakonia, UNICEF, AUB and UNFPA in Lebanon and abroad. 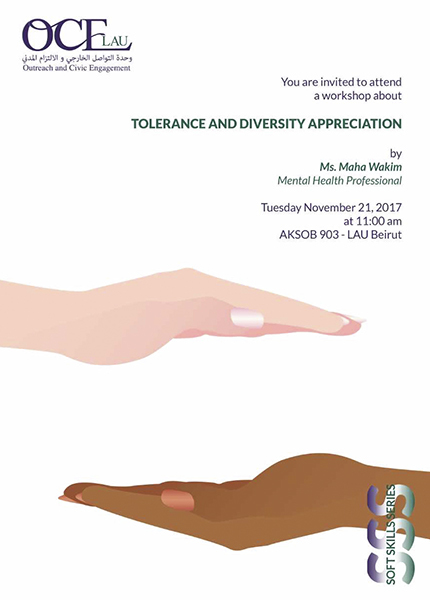 Transportation from the LAU Byblos lower gate will be provided at 9:00 a.m. Return will be from the LAU Beirut lower gate at 12:45 p.m.
To attend, kindly register here preferably before the 19th of November 2017.